I took this shot at Niagara Falls today of two friends. 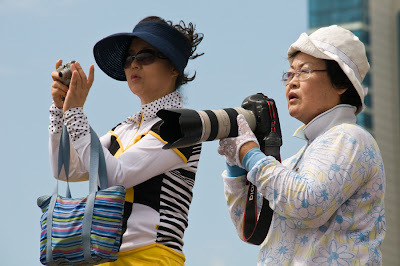 They appear to be tourists who have very different approaches to their holiday photos. The friend on the left has a point-and-shoot while the friend on the right has a Canon EOS 1 with a 70-200 f/2.8 zoom — just about as professional as one can go! I watched her for a while and she seemed to really know what she was doing. I tried to copy some of the scenes and angles she was shooting, but alas this was my best shot of the day. Gee I wish I could have seen her shots!